I was looking for a dark anime, something tearful and really emotional. IT WAS POST-APOCALYPTIC DONUT CATS?!?! This is exactly what "post-apocalyptic donut cats" sounds like. Watch it. Watch it now. The episodes are only like 1-minute skits. It will make your day/life. For All of Your Post-Apocalyptic Animal Foodstuff Comedy Needs! This is not the show you were expecting. But it's the one you need to watch. In all actuality, give it a chance. And by a chance, I mean watch the whole thing, they're short, it takes less than one episode of other shows. You're not that busy. You're the one who somehow managed to end up reading reviews on a show about a cat who is also a donut. If that idea in itself is intriguing to you, dive in! If it sounds stupid, you're probably better off giving this one a miss. This was a funny little short to pass time when I was bored. The story is pretty funny, and actually really interesting. I've also read some of the manga and would recommend both. Although if you watched this first and want more on the story go read the manga neither really spoil anything. The manga is a way longer and talks about the story a lot more. Cute show not meant to be taken seriously. I love this show for the cute characters. It's pretty much just pure silliness and cuteness with an underlying tone of seriousness. This show is set in a post apocalyptic type world and the food animals have short little adventures together. If you watch this show and don't really understand what is going on read the manga first and it reveals a lot more details and a story develops. i dont know what much to say besides i really love donyatsu! its really charming and funny i love the character design and also!! the episodes are short so people who worry about watching anime that have over a zillion episodes wont haveta worry about that issue with this! i think id recommend reading the manga as well it has a bit more context to the situations that happen in the anime! Donyatsu is incredible and I don't know that else to say. 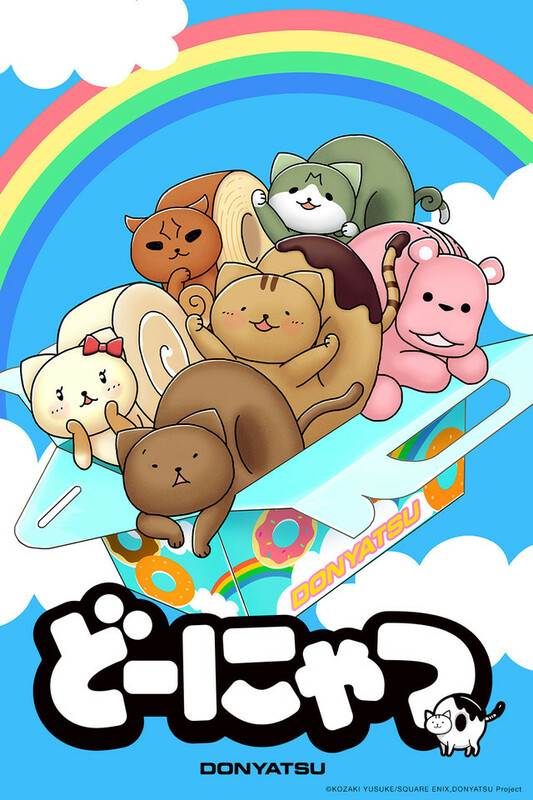 Its cuteness and its surrealness are such a fun mix that I don't know if there's anything like it. The implied story is oddly detailed, but never the focus. It's a lighthearted romp through a burnt out city. What more do you need? Look, I'll admit it. I'm still not sure if I like the manga series of this or not. I read multiple volumes of it and never came up with the answer. But what kept me reading even while I was ambivalent towards it was how strong the dichotomy was between the cuteness of Donyatsu and friends and the starkness of the world that surrounded them. What made me turn the next page was to find out what happened to this world. Not even answers, as I'm convinced the animal baked goods (and thus the readers) will never receive a real answer. What you want are the crumbs left over to build an idea. That. That got me. None of that was to be seen in these episodes. For a minute and a half (and how long that seemed at times), we get the animals doing "cute" and "funny" things with nothing about the wider world around them. When Robosaki appeared only once and did absolutely nothing...that was the final straw for me. If you like cute things, you might want to give this a try. If you want something actually concerning Donyatsu and his group, I don't think this is it. Also, though I'm not one to pay much attention to animation quality, the movement of their heads and other elements of this seemed really odd to me. It got to the point where I was hoping they wouldn't move their heads around much during an episode. Funniest Anime I Have Ever Seen! The cats were so cute and funny! I just wish it was longer! I am going to share it with everyone I know!